Have you decided what to give your Dad? Will it be another tie? 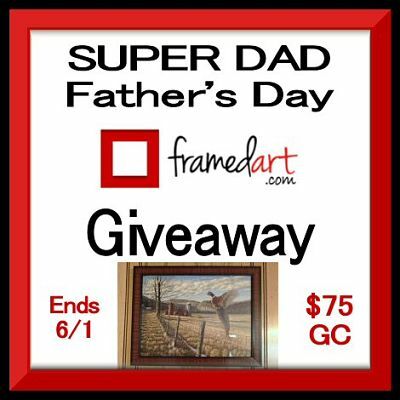 Here is a great idea and prize for Dad. Framed and canvas art that is custom built in the USA by skilled craftsmen. At FramedArt.com you can customize a special piece that he is sure to love and have it delivered right to his door just like I did for my Dad.This high quality pheasant print that I selected for my Father was printed specifically for him by the skilled printing team at FramedArt.com in their New Jersey warehouse. Because of their great selection of of frames and mats in different colors and sizes I was able to find the perfect frame and mat to compliment the print. If you want a ready to hang framed print, this is the site to find it. By following us on our social networks and by email we are able to get the best giveaways together on the internet! Please take a minute to “like” us on Facebook!Thanks! Disclosure of Material Connection: PaulaMS received the products mentioned above for free to facilitate the writing of this review. Some of the links on this blog post are affiliate links. This means if you click on the link and purchase the item, I may receive an affiliate commission. Regardless, she only recommend products or services that she uses personally and believes will add value to readers. I am disclosing this in accordance with the Federal Trade Commission’s 16 CFR, Part 255: Guides Concerning the Use of Endorsements and Testimonials in Advertising. I love that he recognized where he was doing wrong and changed to do better, not everyone can admit their faults and try and change.